VisionAire 2 supports pediatric care with two types of flowmeters. The standard flowmeter has 1/8 LPM increments up to 2 LPM and is suitable for adult use where lower power consumption and cooler operating temperatures are valued. The alternative flowmeter has 1/10 increments up to 1.0 LPM. 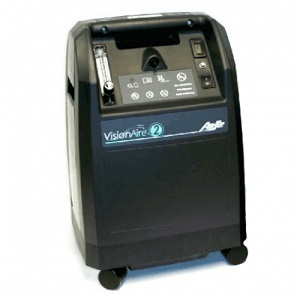 VisionAire Family concentrators are maintenance free and feature a compact, lightweight cabinet design. * We include a 6 month soft goods kit that includes tubing, cannulas and humidifier bottle with new purchase.